I am tackling a new book. I usually don’t read much this time of the year but this book looks interesting. It’s called Making Sense of Scripture by David J. Lose (my preaching professor from Luther Seminary)…and of course it’s from Augsburg Fortress. I received this FREE copy from the Book of Faith Initiative because I responded to one of their tweets (on Twitter) about the challenges of encouraging people to engage scripture. I didn’t respond to the tweet to get this book but it just so happened that I came across the tweet during a frustrating time. Maybe this is God’s response to me. …This past Sunday, as kids were coming up front for the Children’s message, one of my 5 year olds saw me holding the Spark Story Bible (I read the Christmas story out of it for them), which she has at home. As she came up to sit by me she said “We are almost done reading that”. I know her parents read that to her every night and she loves it. Hopefully this becomes a long-term “habit” for her. Stories like that are encouraging, but they seem few and far between. Maybe this Making Sense of Scripture book will prove to be a good resource. I don’t have much to say about the book yet since I just finished reading the Introduction, but hopefully I will have more to report as I read, discover and learn. My struggle to get people to engage this book of faith is going to be an ongoing one but hopefully I can start to make some in roads very soon (at least it looks like I have with one 5 year old). Half way through the 2nd chapter. The book is written as a question/answer dialog; questions that Dr. Lose has heard and fielded over the years of teaching and visiting with people. So far…very interesting. The Bible is not some big, divine reference book, but rather God’s living, breathing, active Word. I like that. 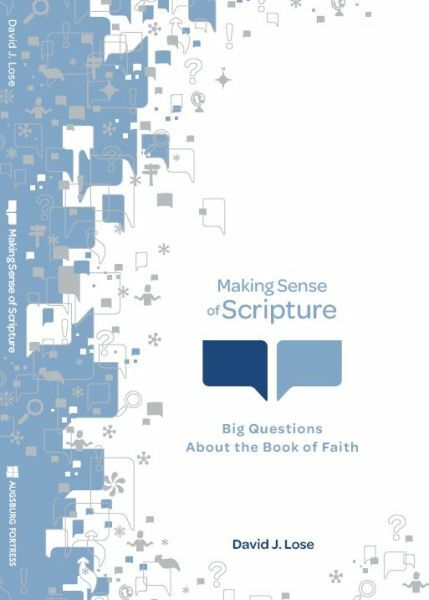 Thanks for taking a look at David Lose’s “Making Sense of Scripture!” It is one of the most popular among our wide range of resources in support of the Book of Faith intiative! And, thanks, too, for the great story about the “Spark Story Bible.” Stories like these that illustrate the connection between kids and scripture via our work on resources like this one keep us going at AF! This is what we are called to do…publish great faith formation resources for people of all ages! Please don’t hesitate to let my collagues and me know how we may assist you in your ministry. And, thanks for your blog! I always enjoy reading it. I learned about “Making Sense of Scripture” when David Lose spoke at the SW MN Synod Fall Theological conference this year. I really like how he laid out the book…as a conversation. It’s really effective. This looks like a great book. I’ve added it to my wishlist. I’m interested in your wording when you talk about the “challenge of encouraging people to engage scripture.” It seems like so often people talking about trying to get people to “read” the Bible. Obviously, “engaging” scripture is something more, but I wonder if “different” would be a more accurate description than “more” in some cases. What I mean by that is that, for instance, I’ve read through the Bible several times in the past 10 years, but recently I’m going through a time where I’m having trouble motivating myself to sit down and read even entire books of the Bible, to say nothing of the whole thing. But I’ve found that my past efforts are still paying off as a lot of events in my life call passages of the Bible to mind. I guess that’s scripture engaging me. For my part, I’ve been trying to engage the lectionary texts each week before meeting them again in worship. I don’t mean this to excuse me from also reading the Bible in larger parts. I see that I’m rambling and possibly completely off topic. Anyway, I guess what I’m really after in this comment is asking your thoughts (and insights from the book) on how people should approach engaging scripture. Like, is reading cover-to-cover really a good first goal or would you suggest something different? Apart from my personal experience above, I’m trying to figure out a way to get my daughters (8 & 12) into the Bible. We’ve done family reading before, and they like that, but they never have any questions, so I’m never sure how engaged they are. From what I have read so far this book help people engage scripture by answering some tough questions that many people have. Chapter 1 deals with the question “What is the Bible?” and why it is a book worth reading. Chapter 2 tackles the question “Is the Bible true?”; does it matter to me now; is it relevant? Ch. 3 is “How is the Bible the Word of God” and Ch. 4 is “Where did the Bible come from?”. Chapter 5 (which I haven’t read yet) is titled “How can I read the Bible with greater understanding?” I am really looking forward to this chapter. I am guessing there might be some ideas to help you help your kids. I am thinking that if we can help people understand the Bible better and what they are reading/engaging they might be better able to see how scripture engages their lives in the here and now (if that makes any sense). Hopefully I will have some more insights later on. Does this at all help? I guess it depends on what we mean by “understanding”. The one question my younger daughter asks about the stories she hears in Sunday school is, “Did that really happen?” My wife and I tend to disagree on how this should be answered for an eight-year old, but I’ve conceded that “yes” is mostly an OK answer. I was thinking maybe I’d spend some time trying talking to my daughters about the story of Israel and the historic setting of the Roman occupation and so forth and then start reading Luke’s gospel with them. I’d like to think they’d understand Luke better that way. I’d like to think it’s a short step from that kind of understanding to seeing what it has to do with life today, at least if we have understood correctly, but that always seems to be the hard part. I am curious if you have read the book and have used it in a teaching situation. Say more about the book and its value. Bob — I have not used this book in a teaching setting, but I am exploring doing that in some way. Whether I actually use this book or some the concepts, I am not sure. Value: I think its value is that for the lay person, this book is very accessible. It is not overly academic. So because of that I think it really explains well how people can dive into scripture in a way that they can gain more understanding and insight. I would recommend that you get a copy and check it out yourself. I am still working on this book. I haven’t posted here for a while but I will add more thoughts here soon.